Experience The Difference...Discover The Value!ABOUT US:Family ownedand operated, J. Ryan Fine Jewelry is committed to the satisfaction of its customers. We are supported by a team of seasoned diamond, gemstone and jewelry experts that are ready to assist you with all your fine jewelry needs. Our master jewelers have spent years perfecting their craft. We guarantee your selection is of the highest quality.At J. Ryan FineJewelry, we understand just what a jewelry purchase means. A jewelry purchase is often made to express one's love for the wearer, and to celebrate life's special occasions. Each piece should be as unique as the moment it commemorates. Our strict quality standards insure that only the finest materials are used to create a piece of exceptional craftsmanship. We are providing you the same quality found at many high-end, boutique stores, but competitively priced.So go on...give us a try! 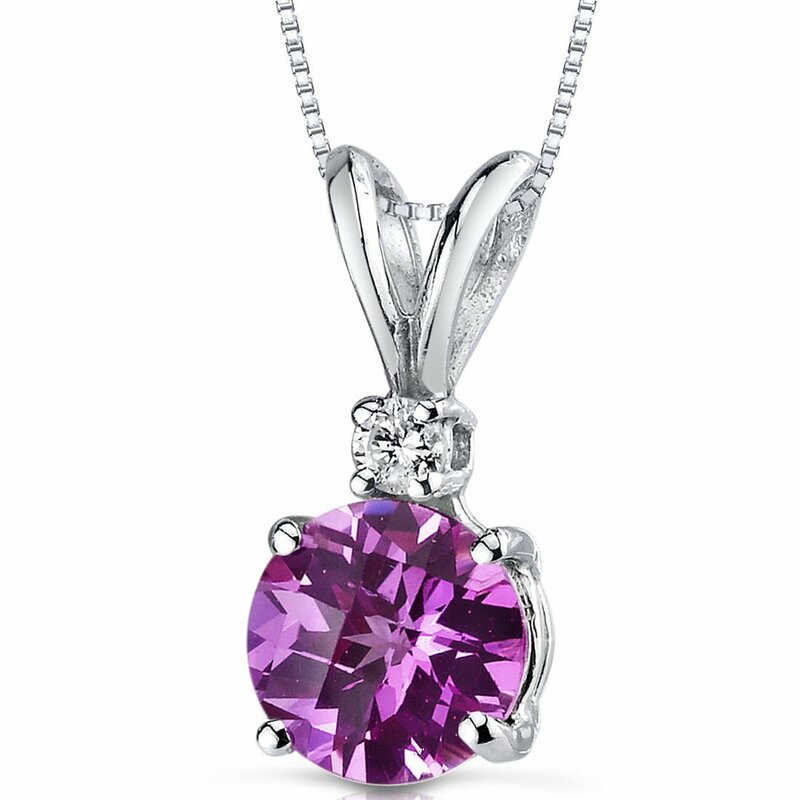 Experience the Difference...Discover the Value!MSRP: $649.99Our Price: $319.99Savings: $330.00Item Number:P8980Availability: Usually Ships in 5 Business DaysPRODUCT DESCRIPTION:Crafted in 14k White Gold, this classically designed pendant features a beautiful round Lab Created Pink Sapphire accented by a brilliant round diamond.FEATURES:Crafted in 14k White Gold6.50 mm Round ShapeLab CreatedPink SapphireBrilliant Accent Diamond18 Inch Box ChainPRODUCT SPECIFICATIONS:Metal Type: 14k White GoldPrimary Gemstone Type:Lab CreatedSapphirePrimary Gemstone Dimensions: 6.50 mmPrimary Gemstone Weight: 1.35 CaratPrimary Gemstone Color:PinkSecondary Gemstone: DiamondDiamond Color: GDiamond Clarity: SiChain Type: Box ChainClasp Type: Spring Ring ClaspRETURN POLICY:30-Day Satisfaction GuaranteeJ. Ryan Fine Jewelry is committed to the satisfaction of its customers. We offer a 30-Day Satisfaction Guarantee with every purchase, giving you the time you need to make sure that you have made the perfect jewelry selection.If you decide that you would like to return your purchase, you may do so within 30 days from the date you receive your order. The item must be in its original condition. Once your returned item is received, our Quality Control department will review the item. Items that have been altered, resized, damaged, or show signs of wear will not be accepted for return.